New Year’s Eve was always a special time in my family, a night for major partying at my grandmother’s house. I loved those days so much I wrote a play about it all. With my current low-fat, low-salt, low-sugar diet, however, finding a place for a New Year’s Eve Gala serving food I can eat seemed a challenge to me. 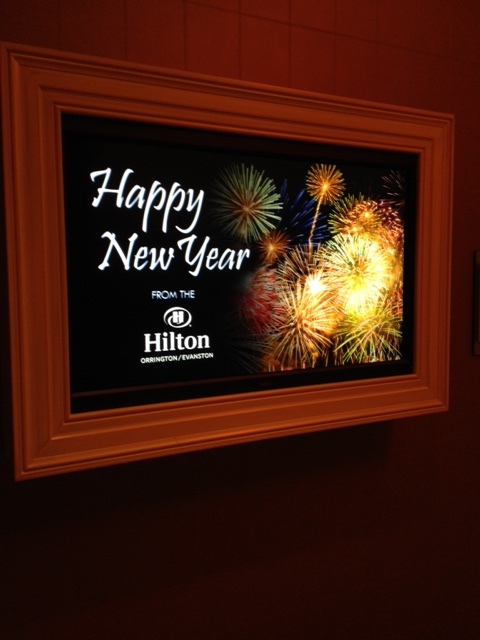 Luckily, the Hilton Orrington hotel in my town of Evanston came to the rescue this year. The Orrington is an Evanston landmark that has gone through its ups and downs in the almost 40 years that I’ve lived here. Thankfully, its in a major up period now and the special New Year’s Eve celebration it hosted for 2015 showed that in spades. 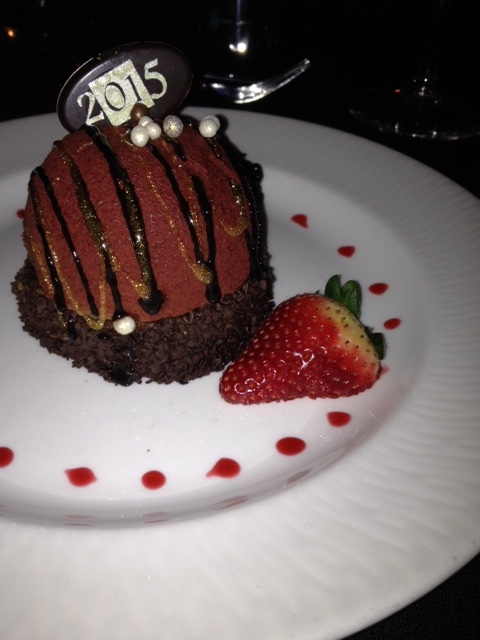 New Year’s Eve at the Orrington was a big hit for us. My wife and I attended what the Orrington was calling it’s New Year’s Eve rooftop gala after I checked the menu and saw that it was friendly to my diet. 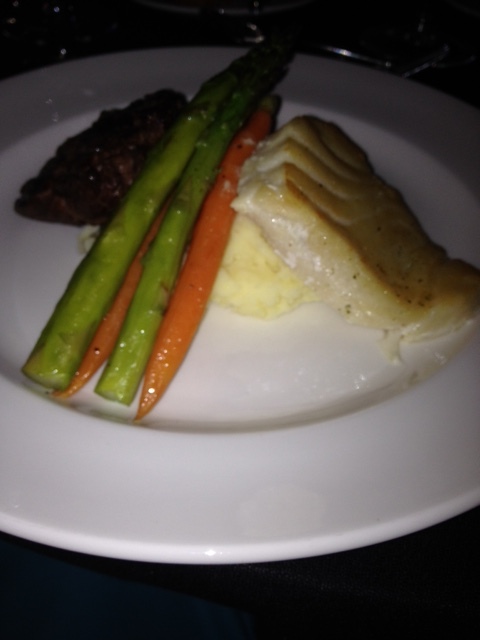 The main course was a combination of sea bass and fillet mignon, the only steak I eat now because of its leanness. Sides were vegetables and mashed potatoes. I contacted the event manager and mentioned my diet issues and was told everything could be prepared in a low-salt way and all sauces would be served on the side, which they were. The meal was delicious (I did leave the mashed potatoes worried about fat in the milk used) and was made all the more tasty by knowing I didn’t have to worry about it damaging my heart or arteries. I did splurge on an amazing chocolate dessert. even that was easier knowing the rest of the meal was low-salt. My New Year’s Eve meal of steak, bass and veggies over potatoes. Even appetizers served before the meal seemed ok for my diet since there was chicken on skewers which I enjoyed. I did pass on the baby lamb chops, which I would have devoured in a previous life. 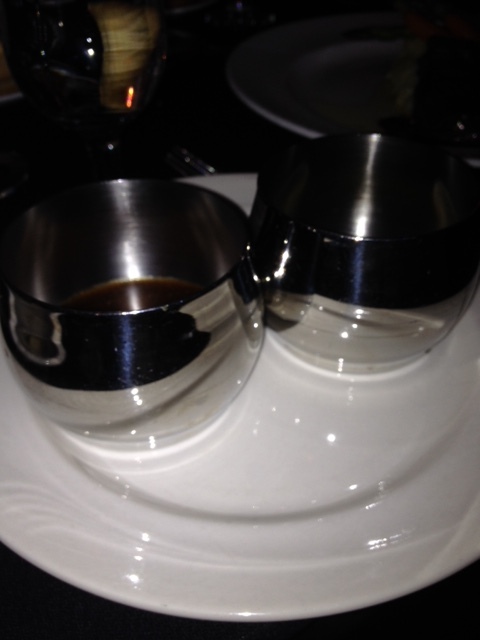 Others at our table said they were delicious. My wonderful chocolate dessert at the Orrington. Thank you Orrington for a wonderful evening, and for understanding a request for a low-salt dinner. You helped us ring in the New Year right!